Daniel Kahneman has made theoretical and empirical contributions that have shaped our understanding of judgment and choice processes in fundamental ways and are being used to understand and modify real world behavior. With fellow psychologist Amos Tversky, Kahneman put his early insights into the nature and limitations of attention to use to model the interplay between the alternative presentation or framing of information, its mental representation as a function of the internal state of the decision maker, and decisions based on that information. Prospect Theory formalized their insights about the encoding of outcomes relative to a reference point, the effects of seeing an outcome as a relative gain or loss, and the role of certainty and uncertainty on choice. The initial 1979 Prospect Theory paper is the most cited publication in Econometrica and contributed to the emergence of the new discipline of behavioral economics in the 1980s. Prospect Theory also holds a central place in the even newer discipline of neuroeconomics, which examines how the brain computes and represents value and likelihood and which also has drawn on Kahneman’s conceptualizations of different sources and types of utility. Kahneman and Tversky’s insights in the early 1970s about the heuristic ways in which people often make implicit judgments of likelihood spawned a huge and sometimes productively controversial research enterprise on heuristics and biases in cognitive and social psychology that continues to this day. Kahneman’s work put non-analytic processes on an equal footing with analytic processes. His distinction between an intuitive, association- and affect-driven System 1 and an analytic and rational System 2 has been a very influential and useful metaphor that has been adopted not only in multiple subdisciplines of psychology (cognitive, social, clinical), but also in neighboring social sciences like political science and economics. This greater focus on emotional processes, together with his work on the nature of utility and on the evaluation of experiences that unfold over time led Kahneman to his current research focus on hedonic psychology, the study of what makes experiences and life pleasant or unpleasant. Here, in an area with large public policy implications, Kahneman has again provided great improvements in both conceptualizations and measurement methods. 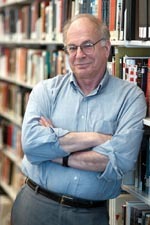 Daniel Kahneman was born in Tel Aviv in 1934. He received his B. Sc. with a major in psychology and a minor in mathematics from The Hebrew University in Jerusalem in 1954. After serving in the psychology branch of the Israeli Defense Forces, he got his Ph.D. degree in Psychology at UC Berkeley in 1961. He subsequently taught at the Hebrew University in Jerusalem (1970-1978), the University of British Columbia (1978-1986), and the University of California, Berkeley (1986-1994), before moving to Princeton, where he holds a joint appointment in the Psychology Department and the Woodrow Wilson School. Daniel Kahneman is a member of the National Academy of Sciences, the American Philosophical Society, and the American Academy of Arts and Sciences. He is a fellow of the American Psychological Association, the Association for Psychological Science, the Society of Experimental Psychologists, and the Econometric Society. He has been the recipient of many awards, among them the Distinguished Scientific Contribution Award of the American Psychological Association in 1982 and the Grawemeyer Prize in 2002 (both jointly with Amos Tversky), the Warren Medal of the Society of Experimental Psychologists, the Hilgard Award for Career Contributions to General Psychology in 1995, the Lifetime Contribution Award of the American Psychological Association in 2007, and the Nobel Prize in Economic Sciences in 2002. He has and continues to inspire and influence a large number of students, postdoctoral fellows, and junior and senior colleagues in psychology and related disciplines. Russell J. Fuller, Fuller & Thaler Asset Management, Inc.
* The FABBS Foundation would like to thank Dr. Elke U. Weber and Dr. Craig Fox for nominating Dr. Kahneman for this honor and for leading the effort to spread the word about his nomination. Would you like to honor Dr. Kahneman? It’s not too late to have your name added to the list of donors! You can make your donation to Dr. Kahneman’s In Honor Of… campaign at anytime.